2.) RSVP on this Facebook Event. 3.) GET PUMPED UP to fight for your education! 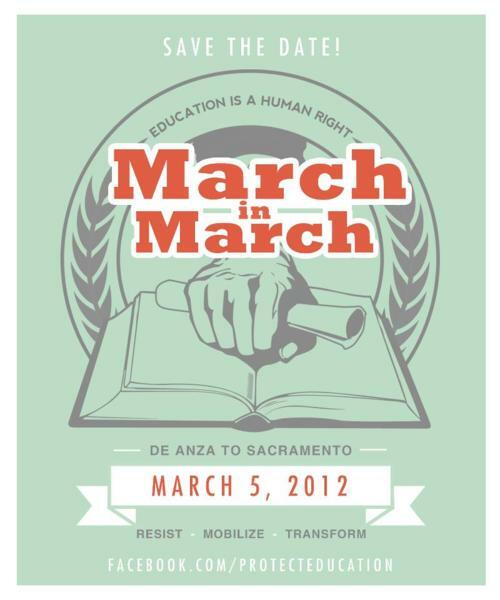 On March 5th, De Anza joins UCs, CSUs, and other community colleges in a unifying, statewide march to the state capitol to advocate for higher education. Our purpose is to create greater awareness about the importance of higher education. This year, we have faced some of the harshest budget cuts, and we students demand greater support from the state legislators. What we hope to achieve is institutional changes on how the government supports higher education, creating a statewide awareness about the importance of our education, and empowering students to be the instruments of change. De Anza College will be providing free bus transportation to mobilize 300 students to Sacramento in an effort to stop to the cuts and fee hikes to education. Most teachers are excusing their students from class on March 5th and several are giving away extra credit for attending the march (you should check with your teacher!). Reserve your spot on the bus to stand up for your right to an equal and affordable education! For those of you that wish not to take the bus, but want to carpool or drive there yourselves, the address of where we are meeting is 2115 6th Street, Sacramento, CA (Raley Fields). This location is designated for bus parking ONLY. You may park nearby the area in parking garages etc. so make sure you look it up before you go. U.S. Troops OUT of the Philippines and the Asia-Pacific!